Sagebrush Model 2 bdrms + den, on Premium lot w/open views in front & at back. Gorgeous curb appeal w/brick front elevation & colorful desert landscape. Great room floor plan w/bright natural lighting t/o, custom window blinds, 18'' tile flooring, upgraded lighting & ceilings fans. Kitchen is complete w/bay window seating, solid maple wood staggered cabinets w/pullout shelving, Corian counters, breakfast bar w/barstools & all appliances included. Master suite has plush carpeting & spacious walk in closet, bathroom has large dual sink vanity & separate soaking tub & shower. Garage is extended length w/built in cabinets, epoxy flooring & workbench. 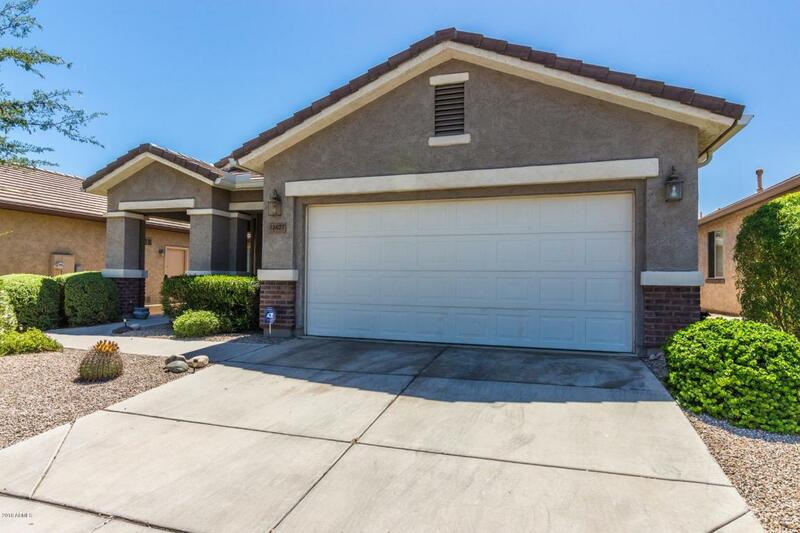 Backyard features covered patio, citrus trees, desert landscaping & open views. See attached list for upgrades. Immaculate & move-in ready!